At first it was we got a teaser which really didn't explain the storyline, but this one goes a little more indepth and makes me want to watch it oh so much. Oh, and if you notice in the IMDB entry, there's a guy who plays the "beer vendor" whose real name is George Romero, but no, it's not the one you're thinking of. This post modern love story is never what we expect it to be â€” itâ€™s thorny yet exhilarating, funny and sad, a twisted journey of highs and lows that doesnâ€™t quite go where we think it will. 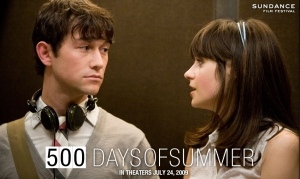 When Tom, a hapless greeting card copywriter and hopeless romantic, is blindsided after his girlfriend Summer dumps him, he shifts back and forth through various periods of their 500 days â€œtogetherâ€ to try to figure out where things went wrong. His reflections ultimately lead him to finally rediscover his true passions in life. I would watch Zooey doing laundry, reading the newspaper or combing her hair for literally hours and be content. I saw this film last night at the Atlanta Film Festival, and I think it was great. If you like the trailer then you will love the movie. It plays just as happy go-lucky except for the times where Joseph Gordon-Levitt is depressed, but even then its still funny. One of the first Romantic Comedies in a while that actually stresses the Comedy part. It was a sold out show and at times the entire theater was laughing at loud. I will check it out once it hits theaters again.